Sonos confirms Alexa voice support coming in 2017 | What Hi-Fi? All Sonos speakers will get a free firmware update allowing voice control with an Amazon Echo or Echo Dot – and it won't be the only supported voice assistant. Sonos confirmed a free firmware update will launch later this year, bringing Amazon Alexa voice control to all Sonos speakers. At an event at the company's Boston HQ, Sonos announced the news teased last year, confirming Alexa support would launch "later this year". 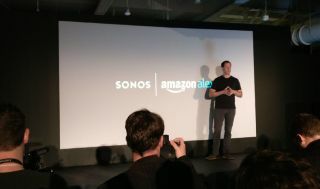 As well as support for Alexa, an early example of which was demonstrated at the event, Sonos said it would support other AI assistants, promising to build an "agnostic voice platform that works with the best voice assistants out there". Google Assistant is already available in a wireless speaker, built with Harman-Kardon. Sonos also reiterated it was working on a speaker with Alexa voice control integrated, so you won't need to add an extra Amazon device. No doubt this will come after the initial Sonos Alexa support is rolled out.